Save yourself some number crunching and use this collection of 91 fully statted and ready-to-run nonplayer characters. Whether you need a veteran Pathfinder, an eccentric Red Mantis assassin, an undead-hating Nexian mage, or just a rough-and-tumble thug, this book does the dirty work for you! A free Web Enhancement featuring five additional NPCs was featured in the Paizo Blog. Uses old D&D rules so no Witches or Maguses etc. The class builds are therefore not powerful enough for modern PF. They are also quite dull, far, far too many 5th level ranger guides and Dex based sword using rogue/fighter types. It is quite odd, they seem to account for about 50% of the characters. A sequel is very much needed. We need all the newer classes, and fill in chracters from other lands - Casmaron, Vudra etc. This is an area the book really shows its age - there are no proper Varisian or Sczarni characters and only one (fairly bland) Hellknight! Modern PF would probably have a dozen. To its credit, the little picture portraits are great, and the mini biographies and boon hooks are of proper Paizo standard. It is hard to complain becuase this fluff is excellent, but the crunch lets it down and seeing as we don't even use those rules any more, it probably doesn't matter. Could have been far better. Every GM's nightmare: NPCs. Coming up with believable, memorable and challenging personalities for PCs to interact with is an art, learned over years of experience and gaming. But that's just half of the challenge, since we're talking D&D/PF here, we need to tackle the daunting NPC statblocks, full of abilities, spells and other things that require time and energy to create. NPC Guide consist of 3 chapters. Chapter 1, titled "Named NPCs" contains 30 fully-fleshed NPCs, each one with a portrait, backstory, statblock and suggested "boons" which they may bestow upon PCs. Chapter 2 presents 50 generic NPC statblocks - no fluff, just stats. Finally Chapter 3 describes Paizo staff PCs from their personal campaigns. While the quality of writing, artwork, ideas and fluff is great, the book suffers from two serious problems, which somewhat cripple it's usefulness. Firstly, almost all the statblocks presented in NPC Guide are low level. Only a couple of named NPCs are above CR 5 and all of the generic statblocks are below it. This is a major blow, because arguably the most time-consuming and demanding part of NPC creation is the science of statblock building. The second problem is that there isn't really anything in the way of new rules elements (items, spells, feats, etc.) to support the NPCs. In fact, being mostly low-level, they tend to be rather bland on the crunch side. While it's very nice to see dozens of both common, generic NPCs and more fleshed-out personalities, I fear that this wasn't exactly what a harried GM is after. Knocking together a level 3 NPC isn't that hard (especially with Hero Lab around), but the high level statblocks are killers. 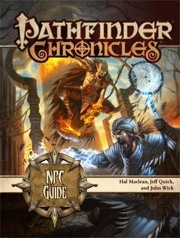 Luckily, Paizo seems to have realized the error, and the recent Rival Guide is everything such book should be. Does the Gruntwork of making Grunts. Will they have short histories and such as well? I have a few books with various NPC's in them but I would like a way of tieing them into the PRPG campaign setting and this could be that answer. Thank you again Paizo. And I still wish I had more money coming in so I could buy more. Dagnabit!!!!!! Damn, I'm a sucker for products like these. Faces of Sigil was one of my all-time favorite TSR books. I'm rather happy to see a product like this coming out. I've been running Star Wars Saga for about 6 months now, and I find the ready to use stats for the various goons/jedi-sith/monsters to be rather handy for my prep. It'll be nice to have some ready to plug-in NPC's to throw in a game for encounters now, especially having them all in one source. You know, back when WOTC started to put monsters with class levels in the Monster Manuals, I didn't like it, but not because I didn't want monsters with class levels, but because I wanted a Monster Manual to introduce new monsters. I actually did want a book that gave me characters with the stats already done. In fact, I really liked some of the "generic" NPCs in Cityscape, for example, in case the players do go off the rails and you need to have some stats handy, or just don't want to build someone from scratch. On top of all of that, I really did want a book back in the 3.5 days of Realms NPCs that were flavored for their particular factions and useful as utility characters, such as Zhent patrols or Eldreth Veluuthra assassins. This product sounds like it has a lot of potential. I'm really hoping for good things from this. Oh yes. This and Gamemastery guide in play, nothing can go wrong. Ahh, the very, very last thorn. How to use old stat blocks with Pathfinder PCs and NPCs, and now this. Anything that sheds more minutes off DM prep is a win in my book. My feelings exactly. I have high hopes for this one, and I'm sure these plug-in NPCs will also prove to be handy when GMs design their own villages and towns. I really like that the Paizo staffers' characters will be in this! This product reminds of the old 1E (AD&D) Rogue's Gallery, which I really loved! Paizo has this amazing way of producing products that feel 100% contemporary and 'state of the art', so to speak while at the same time having this great old school vibe. There goes my first potential Pathfinder product...already planned by Paizo. Woot! I've been waiting for a book like this. Any chance the Iconics will show up in here with expanded background? There's always room for more goodness. I’ve wanted to pitch and write an NPC product like this for a while and every time it would come up, someone would tell me how these kinds of books aren’t popular and folks don’t want another books of NPCs. Damn you peers! I’m glad you help me prove my point that there are heaps of gamers that would find a book like this very helpful for fleshing out their games. I’m looking forward to this one! Rogues gallery FTW! Very old school. Ezren is straight-up strangling a dude on that cover. Nice to see a wizard pushing sixty who isn't afraid to lay the smack down. True, but that's place holder art. What type of NPCs will hope in this manual? will we see the Whispering Tyrant, the Harlot Queen, Nex, Geb or some NPCs of that calibre? Premade stats and personalities? Awesome! Anything that makes 3.5 DMing easier is a blessing... A BLESSING I TELL YOU. Particularly at higher levels but I won't have to worry about that for awhile. Probably not, no. We are going more for NPCs usable in a wide variety of campaigns. Almost all of the characters you mention are godlike in power, and would probably be better handled in a specific book about them or a high-level campaigning sort of book. Good, I'm hoping for more "Hellknight Captain" and less "Paralictor So-and-so." As far as the big guns mentioned above, I'd rather only see them, if at all, as "short form" stats, i.e. level range, class, alignment, unless they appear in an actual adventure as someone the PCs are suppose to take a whack at. I may be weird in this regard, but I actually prefer statting up the longer statblocks for a BBEG or challenging encounter, so lots of more normal peoples stats will save me alot of time. Some will complain that they could have done them themselves, but I'm glad that with this book I wont have to as often, and can have more fun making interesting combats, and bosses! Any way to predict when we will see the card deck for these NPC's? I voted for Gulga Cench! When does he get his stats? ...this is just me putting in my two copper pieces for some less "normal," more "memorable" NPCs. If Paizo is going to do an NPC for each nation in the core setting (which is what the ad blurb says), I know quite a few people interested in the Zephyr Guard, who don't have too much to go on in the LoF AP so far (and there isn't too much in "Dark Markets" either). Paizo, I know you can do it! They could be so cool! Wait a minute... are these going to be the Paizo staffers' PFS characters? Like Bulmahn's cleric of Pharasma? Will there be a Parental Advisory on the cover? Listing for "squads" (Bandit Group, Drow Raider Party, Dwarven Patrol, Orc Raiders) with several ELs ? For a quick and dirty random encounter. I'll echo Knights words on this, i.e. low to mid-level NPCs that could be dropped pretty much everywhere. For example, innkeepers, merchants, assassins, bandit lords, twisted nobles, mercenary captains, necromancers, clerics, wizards, slavers, pirates, druids, venture captains, and so on (mostly adversaries, but also potential allies and employers and yet just some "flavorful" characters that add more depth to the setting, e.g. armorers, instrument makers, sages/seers/oracles, jewelers or philterers/apothecarists). All in all, I see this book containing useful NPCs from many walks of life to use them in encounters or add some local color, and plot hooks and ideas plus maps related to them. For example, if the PCs go on a tangent, or I'm having a writer's block, I could just grab the book and run, for example, an encounter/sidetrek with a small thieves' guild or a group of bandits hiding in a farmhouse or abandoned wizard tower near a village, with maybe even the final encounter taking place in their employer's (a corrupted nobleman) mansion -- without having to reference stat blocks and maps from several accessories. Or, if the book has adventure outlines I gave an example of above, use one of them. Or, I could drag'n'drop or a well-written, solid NPC into the party if somebody misses a session. How about a section on modifying a NPC class to get a specific feel, such as changing the adept into an arcane hedge wizard for primative cultures. I would like to see sample Pathfinder Venture Captains from different areas and with different approaches to their jobs and to managing teams of adventurers. For example, detailing two competing Venture Captains from Absalom and how they could be used as either patrons for the PCs or as a source of competition. Northlands: Mercenaries in Varisia, Irrisen, and the lands of the Mammoth Lords and Linnorm Kings typically replace standard arms with the following: +1 chain mail and +1 heavy shield (AC 20, FF 18, T 12) and use a +1 battle axe (atk +8, DMG 1d8+6) and replace Mounted Combat with Endurance. Southlands: In Garundi nations south of the Inner Sea, replace the above weapons and feats, blah blah blah. You could do this for either general regions (as above), for a selected handful of a couple of countries per entry just as examples, or whatever other sample alts you wanted. Anyway, seems like an easy way to multiply the utility of the book, because each base stat block has a couple of one-paragraph mods. I would like to see a fair mix of allies and enemies. If every nation's entry is a town guard, I won't use that very often. But if it's a combination of pirates, sczarni thugs, gladiators, city watchmen, troll augers, etc, I can make that work. I would present a dissenting opinion to those above who have said they'd rather have general, unnamed NPCs over named ones. I prefer a name and a backstory. These act as inspiration and plot seeds and would help tremendously in the many parts of the world we have yet to explore beyond the Campaign Setting writeup. If the included NPCs are each a specific example of a generic group, then the statblock can be used alone for the general, while the actual Golarion bits can be highlighted for those of us who want to see the world populated beyond just the adventure paths and modules. Further, my understanding is that the GameMastery Guide is going to include a rogues gallery of general NPCs without the Golarion-specific elements, so I'd like to see this book really play that up. It is part of the Chronicles line, after all. I like Jason's suggestion of offering variations for at least some of the NPCs, which would allow a generic (or even specific) statblock's versatility to grow exponentially. I think this book could also be a great opportunity to use and/or update the 3.5 feats and alternate class features that appeared in the Campaign Setting or other Pathfinder books. New rules always seem more real when they are tied into the world more than just a single time. A big nod of agreement to both of the bolded sections above. Golarion it up fo sho! I would like a good mix of fluff and crunch. Fluff in names and who the folks are, so as Yoda8MyHead said, we can hang a bit of story on a character and differentiate the guards of Magnimar from those of Korvosa, etc. Hmmm... that would be nice, but I wonder if there will be a feat book somewhere along the line? At least I think it was James who said they might update (rewrite?) feats from non-OGL sources such as PHB II into PF RPG rules (and I personally think it would be cool to have 'Short Haft' and 'Bounding Assault' et al. as 100% "legal" options in PF RPG, instead of being only allowed if your GM is okay with 3E splats). I hope that, among the other things PAizo has so obviously learned, this idea of endless "crunch" is not the way to go. Unless you have a GM who has photographic memory, or who is insane, the LAST thing a DM wants is book after book of new rules to read through, learn, or discard. This is why so many revile the endless rules of 2E, and a large part fo why I walked away from 3E, and why many others walked away as well. Besides, technically speaking, there is no reason to redo 3E books, since they are all compatible with PAthfinder. Especially feats. 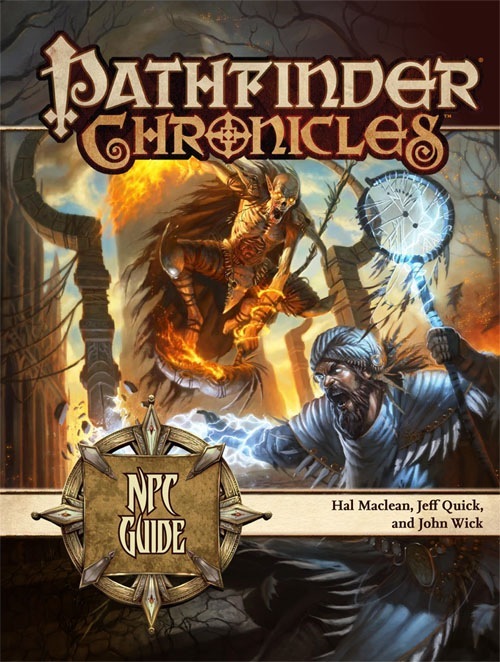 So I hope, and pray, that if PAizo is going to introduce crunch its for the reasons given, to enhance the "flavor" of the setting being presented. More feats for the sake of more feats is already over kill. Its been over kill since early in the days of 3E. To introduce feats in order to make a land, people, or class a bit distinctive from everything else is a good reason. Besides, if WOTC had put more thought into their mass production of feats, they could have sold a lot more books doing it the way PAizo is doing it, by indtroducing new settings, societies, races, and classes related to them, and the feats they have discovered that adds to their uniqueness. Instead they gave 1,001 feats and left it up to already overwhelmed DM's to figure out how to add those feats as an enhancement to their home grown games, or setting they do use. So I hope Paizo has learned from the mistakes of TSR/WOTC on this front like they have on so many others. Besides, if WOTC had put more thought into their mass production of feats, they could have sold a lot more books doing it the way PAizo is doing it, by introducing new settings, societies, races, and classes related to them, and the feats they have discovered that adds to their uniqueness. Another hearty "well said" from me on this one. Feats, PrCs, and even spells and magical items are much more fun and interesting when they are tied to something, like the classic Ed Greenwood spellbook, sword, shield, etc. articles from the old days of Dragon magazine, than just a disembodied list of "hey, here's some new stuff" a la the Magic Item Compendium. Books like that can have their uses, and a lot of folks may well prefer them, but for me I like them all much better when they are connected. Maybe a reason why I enjoyed the Encyclopedia Magica for 2nd Ed more than the MIC for 3rd was partly that it was almost a history lesson on magic items throughout the game, but also so many of them were tied to adventures, articles, or supplements and all of that flavor text carried over into the EM, all 4 volumes of happy magic goodness. * Useful semi-generic NPCs, i.e. a sampling of mid-level Golarion entities such as a hellknight, an Andoran slave-breaker, an Absalom Hotspur, a Kaer Maga troll entrail-reader. These I'd just as soon not have names/backgrounds. About 1/3 to 1/2 the book. * A proper rogue's gallery like the back half of the TSR classic. This would be the staff characters section. Focus on "interesting" more than campaign-useful would be a big plus - I want to see what I can do with the world, not be given a new batch of world-shakers. 1/4 to 1/3 the book. Probably a page to pages each, so there's not necessarily a tremendous amount of room here once art is factored in (from my experiencing, crunching a spellcaster down to fit a single page is a lot of work). * A few NPCs of fair regional importance. For example a famous venture-captain, or a vampire lord of Ustilav. Balance these between informational value and playability. Half the remaining balance of pages. * A smattering of non-humanoid entities of importance. We've done dragons, but we could use a coautl, a sphinx, or maybe a half-fiendish otyugh. These should be skewed for GM use in a plot of their own divising. Half the remaining balance of pages. Can I get a lair? Hmm. On Lilith's angle, it might be nice to have guidelines for converting generic NPCs between races. This would include a note on each for how on how to take the current race off, and generic rules for adding a race. That might be too complex, though. Especially when favored classes are factored in. I can completely see where people would want some inspirational background material, at least for "higher than mook level" NPCs, such as a Hellknight Captain. So long as in the end the stats for the Hellknight Captain are essentially pretty close to "average" amongst Hellknight Captains that might be run into. In other words, if the average Hellknight Captain carries X for a weapon, I don't want to see the NPC, for the sake of making him a unique character, carrying some strange exotic weapon rarely used by Hellknights. However, for leader types and the "solo" characters, extra flavor is great. On the other hand, I would also like some low level mook type characters that don't need quite so much background. I would like to see, for example, how a group of Sczarni thugs would differ from a more traditional thieves guild "build," however. Cityscape has kind of an example of this, with a section on NPCs that has the front part of the section with more "generic" stat blocks and then a section called "Villains" that provides some more specific, fleshed out NPCs. I also agree, I wouldn't mind stat blocks for typical potential allies/hirelings either, although if it comes down to space, I'd favor adversaries over allies/hirelings. Too few pages unless you print on microdots or are giving away a CD/download ('NPC Generator'?) with it.